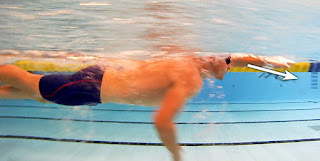 If you have tried to make your stroke as long as possible you might well have introduced a pause-and-glide into your stroke timing, we call this sort of swimmer an Overglider for obvious reasons! We've covered the perils of Overgliding previously on the blog but let's look at a knock-on effect that pausing and gliding can have on another part of the stroke. Overgliders are very focused on their efficiency in the water and are trying to lower their level of effort, in doing so many adopt a 2-beat kick style. This means that for every full stroke cycle (two arm strokes) the swimmer performs two kicks rather than the traditional six kicks of a flutter kick, the idea being that two kicks takes less effort than six. If you have a distinct pause-and-glide in your timing then you are faced with the problem of re-starting your stalled stroke at the end of the glide. With a two beat kick this is a greater problem because not only is your lead arm stationary during the glide but your legs are stationary too! In this situation the Overglider commonly uses a distinct kick-start action to restart their stalled stroke. The irony is that while Overgliders are very focused on lowering drag, many have introduced a very large source of drag with such a large knee bend showing their thigh and back of the calf into the water flow (at its worst in the third frame above). This in turn lowers their body in the water adding even more drag. A two beat kick looks simple but it is very hard to perform well because it requires that many other parts of the stroke are well developed. 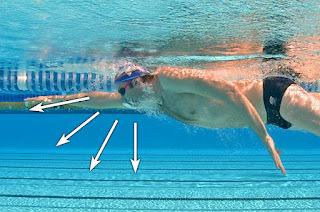 A swimmer must have an excellent catch technique and swim with great rhythm and timing to integrate the two beat kick action into their stroke.Without these elements in place the kick-start action is caused and/or the swimmer sinks lower in the water in the gap between kicks. - Only consider switching to a two beat kick if you are an advanced level swimmer with a good catch, rhythm and timing, potentially seeking to develop economy in open water events over 2km. Head Coach Paul Newsome did exactly this to good effect in 2009 in preparation for his English Channel swim in September 2011, but it wasn't easy and his stroke style changed considerably in the process. - A two beat kick is best suited to those with a shorter punchier style such as Swingers. - For those aiming for a long smooth stroke style, a light flutter kick makes much more sense. The continuous action will help you avoid the kick-start and it will lift you up higher in the water (ultimately lowering effort, not increasing it). Try it the next time you swim, be objective and see how you go against the clock with it. - If you can feel yourself kick-starting in your stroke it's also worth giving your kicking technique a tune up, see here. If you are an Ironman triathlete you've probably listened to the excellent IMTalk podcast hosted by Bevan James Isles and coach John Newsom. This week's show features an in-depth interview with Swim Smooth's head coach Paul Newsome covering all things swimming. The interview starts at around 47 minutes into the podcast and kicks off with a discussion about modelling your fitness using the training metrics CSS and TSS. If you find this a little technical then skip forwards to around 53 minutes where things broaden out and Paul discusses Swim Smooth's coaching philosophy, the Swim Types system and how you can change your approach to swimming to get much better results. As you can see Rebecca sits fantastically high in the water, a body position she can easily achieve despite looking slightly ahead. This is very typical of elite pool swimmers who rarely look straight down or very far forwards. Key point: The very best pool swimmers in the world tend to use a mid head position, looking slightly ahead. Looking so far forwards helps him navigate effectively and find the toes of other swimmers to draft effectively. Note that he can do this while still maintaining a high body position in the water (despite being super-lean). 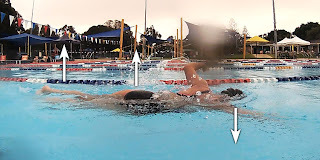 Key point: If you have good stroke technique, you can achieve a high body position despite looking forwards and for open water swimming this is a major tactical advantage. In a wetsuit, the extra buoyancy exacerbates this problem further, leaving her feeling very unstable. We coached Marina to look a little further forwards, rebalancing her in the water while still maintaining an excellent body position. Looking further forwards also helped her proprioception (body awareness) in front of her head so that she could develop a greater feel for the water during her catch. Here Barbara has added huge frontal resistance after being asked to bury her head in the water. Returning to a higher head position and not pressing down with her chest allowed her to immediately swim more efficiently and be much more comfortable doing so. Key point: For swimmers with a good natural body position, looking straight down harms their swimming. If you feel unbalanced when swimming (or in your wetsuit in open water) try looking further forwards and see if it helps gives you stability. - Removing hand-entry crossovers which cause scissor kicks and drop the legs downwards. - Exhaling better into the water to remove excess buoyancy from the chest and make him feel more relaxed. - Keeping his head low and using the bow wave trough when he breathes. Once he's worked on these things he can also try a lower head position to help bring his legs up further. Key point: Looking down can be a useful modification for those with sinky legs. However, it makes navigation and catch development harder so treat it as a last resort by working on other areas of the stroke to improve body position first. You can see from the examples above that selecting a head position should be an individual thing for individual swimmers - there is no universal head position that is best for everyone. Choose the one that feels best for your stroke and allows you to swim faster and more efficiently, then stick with it. When we try this exercises on our Swim Smooth Clinics we always receive a range of feedback with some swimmers feeling better looking forwards, while others improve when looking downwards, others feel best somewhere in between. You can repeat this exercise in your wetsuit, you might well find you can look further forwards which can be a great advantage for open water navigation and drafting. Is Procrastination Killing Your Swimming? Procrastination is a silent killer of swimming performance; it keeps us doing the safe and familiar things, and stops us making the changes that we need to improve. It keeps us on that frustrating plateau we're on, sometimes for years. I haven't been in the water in ages, when I do go back it's going to be a struggle. work on my stroke technique and focus on efficiency. not a strong enough swimmer yet. always stood me in good stead. What I need to do is train harder. Procrastination can take other forms too, such as endlessly studying great swimmers on Youtube or debating technique to the nth degree on internet forums. The more intellectual the swimmer the more elaborate this analysis-paralysis becomes but more often than not people who do this are simply putting off going to the pool and actually swimming. Our suggestion? Don't put it off another day. Commit to a period of six to eight weeks and make some major changes in your approach to swimming. Then focus on those changes every session and be objective about the outcome by measuring your swimming speed before and after. The worst thing that can happen is that you slow down slightly and need to revert to what you were doing before. But far more likely you'll finally get off that plateau and break through to a higher level of swimming. What changes should you make? There are some ideas here and here but quite likely it's the thing you've been avoiding doing more than everything else. If you keep on doing what you've always done, you'll keep on getting what you've always got. It's a cliché but so very true.